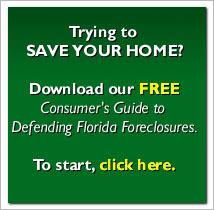 What’s the biggest battle raging on the front lines of the foreclosure wars? The failure of nearly all the banks to comply with the pre-acceleration notice requirements contained in paragraph 22 of the mortgage. On the defense side, we see that nearly every letter that goes out contains some kind of deviation—some large, some small—from the contents expressly required by the contract. When the bank fails to send out a letter that contains all the elements required by the mortgage, we seek, and often obtain, a dismissal or judgment for the defense. In this case Plaintiff’s acceleration notice states “you may have the right to bring a court action to assert the non-existence of a default or any other defense you may have to acceleration and foreclosure (emphasis added).” Plaintiff argues that this language substantially complies with section 22 of the mortgage. The parties know of no appellate decision on point. In the most fundamental sense there is a world of difference between having to bring a court action to assert the non existence of a default or any other defense to acceleration and the right to assert in the foreclosure proceeding the non existence of a default or any other defense to acceleration. The former requires affirmative action on the part of the borrower to file a complaint, which almost all are ill equipped to do, or pay an attorney to do so. It also requires the payment of a filing fee at a time when the borrower is least capable of doing so. It is significantly different from taking no action, waiting until the foreclosure proceeding is filed and then asserting why acceleration is not correct or specifying other defenses. To equate the two is to ignore both the terms of plaintiff’s mortgage and the economic burden of the substituted language. Also, equation of the two requires one to ignore the Supreme Court pronouncements in this area. This is one of the few times in the history of Florida jurisprudence where the Florida Supreme Court has deemed it necessary to subject an entire industry to special rule due to the industry’s documented illegal behavior. The amendment of Fla. R. Civ. P. 1.110 (b) was a direct result of the robosigning scandal. The comments to the rule amendment, In re Amendments To The Florida Rules Of Civil Procedure, 44 So.3d 555, 556 (Fla. 2010) indicate the depth of the court’s concern with this industry. To suggest now that a non-party, to whom the owner of the note has delegated its obligations, has “substantially” complied with the notice provision by wrongly telling the borrowers they have to file a separate law suit to assert their defenses turns logic on its head. It should be obvious that we at Ricardo & Wasylik agree both with the opinion and the strong language the judge felt it proper to use. The decision is Bank of America v. Casey, Broward County Case No. CACE- 12003317 [PDF], January 23, 2013.